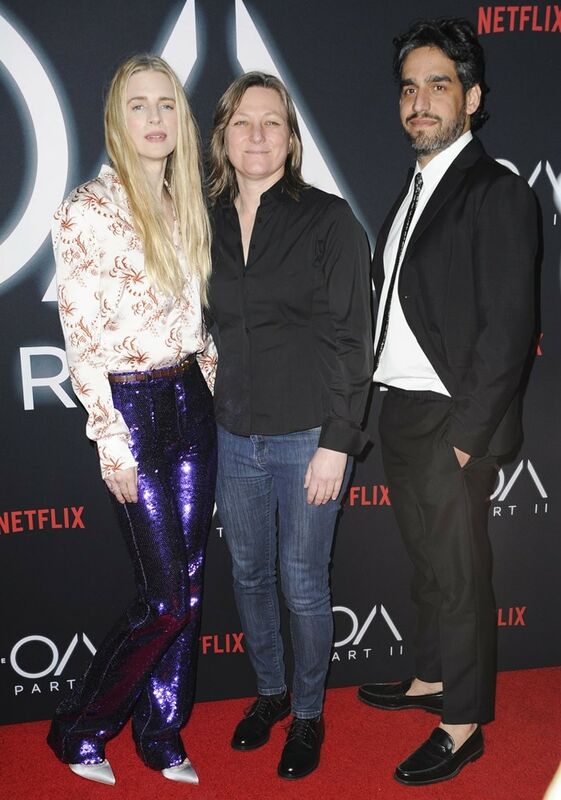 Jason Isaacs and Brit Marling hit the red carpet at the premiere of The OA: Part II on Tuesday night at the LACMA in Los Angeles. They were joined at the premiere of the second season of their hit show by fellow cast mates Kingsley Ben-Adir, Ian Alexander, Phyllis Smith, Brandon Perea, Chloe Levine, Brendan Meyer, and Zoey Todorovsky along with show co-creator Zal Batmanglij. The OA is an American mystery drama web television series with science fiction, supernatural and fantasy elements, which debuted on Netflix on December 16, 2016. Brit stars as Prairie Johnson, a blind woman who went missing for seven years and returns home with her sight restored. The second season (Part II) is set to be released on March 22, 2019. The 36-year-old American actress and screenwriter rocked a masculine outfit from Paco Rabanne’s Fall 2019 collection consisting of a white printed button-down shirt paired with purple sequin pants. Do you think the four-time Independent Spirit Award nominee looked ready to disco? Brit wore her signature long blonde hair down and completed her look with silver satin pumps.